FR 7866 - The Picnic Two-Bottle wine carrier is made of Neoprene and includes two gel freezer packs to keep your wine at its finest. The Neoprene Picnic wine tote is designed with an interior separator to protect two of your best 750 ml bottles of wine, along your travels. 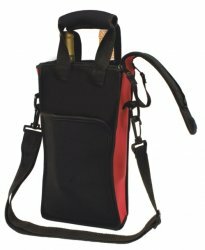 This wine bag is also built with a deep frontal pocket that is great for carrying small wine accessories that you might want to bring. Adjustable shoulder strap and carrying handle also allow for easy transport. Note: Bag comes in a Red / Black combo.